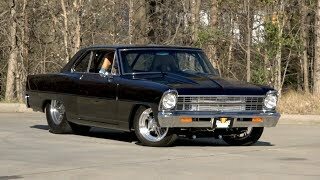 Hi, I am interested in your 1966 Chevrolet Nova (stock #136372) listed on Autotrader for $119,900. I'd like to get more information about this vehicle and confirm its availability. Pro-Built Pro-Street Nova Hardtop 621hp 572ci V8 Auto w/OD 9in Rear Leather A/C /// Sporting tastefully modified sheetmetal that includes 67 Nova fenders and a steel Cowl Induction Hood, this stunning Chevy II benefitted from a professional rotisserie restoration that was completed by Visser Rod and Custom of Havre De Grace, Maryland. Enact the cars custom hood supports and youll find 572 cubic inches of GM Performance Parts big block that cranks out 621 horsepower on plain ol pump gas! Behind the killer mill, a cooled Turbo-Hydramatic 400 3-speed, sourced from ATI Performance Products, employs a transbrake, a reverse manual valve body and a Gear Vendors overdrive. That transmission jerks a narrowed and braced 9-inch thats finished with a Detroit Locker, Strange 35-spline axles and stout, 3.73 gears. That driveline hangs in a custom chromoly and mild steel chassis thats bolted to custom floors and a custom, fully tubbed back-half. Everything rolls on a Heidts PRO-G 4-link, which strings adjustable QA-1 coil-overs opposite a polished Heidts SUPERIDE front-clip. That clip centers power rack-and-pinion steering between a duo of Aldan American coil-overs. A floor-mounted brake booster jolts stops through four polished calipers and four drilled and slotted rotors. And everything rolls on polished Budnik wheels, which spin 205/55ZR16 BF Goodrich g-Force T/As in front of 33x22.00R18LT Mickey Thompson Sportsman S/Rs. Behind the electric doors, a custom, hand-built cage cradles a custom leather interior that was installed by Chuck Hanna of Mooresville, North Carolinas Hot Rod Interiors. 5-point Corbeau harnesses hug tall Corbeau buckets. A custom dash features a full array of Auto Meter telemetry. A custom console frames Vintage Air conditioning, switches for the cars power windows and an angled Hurst ratchet shifter. And in front of the driver, a half-wrapped Budnik wheel laps a polished, tilting column. Call, click or visit https://www.RKMotors.com for more information.